Summary This article describes how to customize askiavista reader web reports. 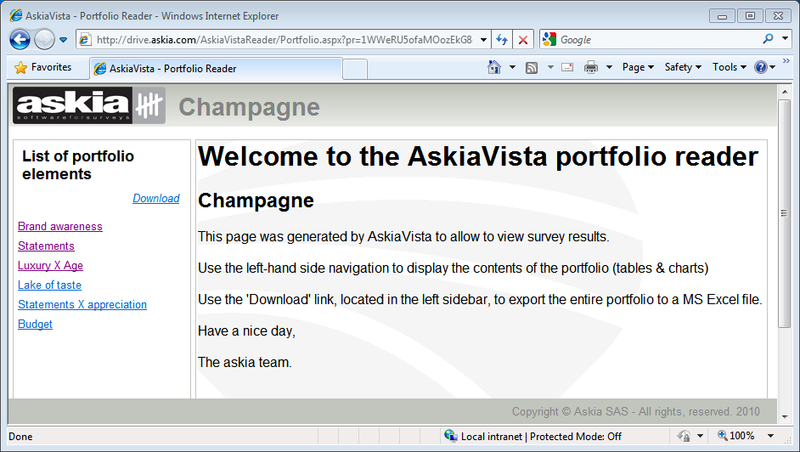 AskiaVista Reader is askiavista's rendering engine for published Portfolios. It allows for custom layouts, and much improves the speed & response times compared to askiavista's legacy Portfolio engine. You can customise and/or create AskiaVista Reader themes. To create a new theme we will copy & paste one of these folders, and give it a new name. Inside the new theme folder, you can now customise your new theme's files - this requires a working understanding of HTML & CSS , if you don't have such knowledge, we recommend you send the files to a web designer/developer. You can modify this page so as to implement your own layout, style & greeting message. We recommend abstain from modifying code between lines 3 to 46. Also, you will notice ## ## flags for pulling dynamic information, we also recommend you abstain from modifying these. Modify this file as you see fit, i.e. in accordance with classes used, added and/or removed from the Template.htm file.